When you think of places for a skateboard park, you generally have industrial sites come to mind. Often it’s an abandoned building or industrial zone or even a city swimming pool that has been converted into a skateboard park for youth in the area, but who would have thought of building a mobile skateboard park? While you may be reading these opening lines and saying “Well this has all been done before” I then throw in the question: On a River Barge? 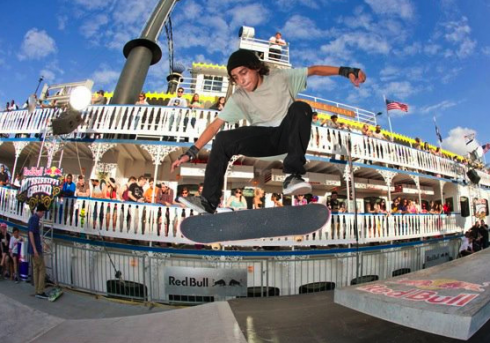 Red Bull over the summer created one of the most amazing skating experiences with a river tour that floated all the way down the Mississippi to New Orleans and showcased some of the United States of America’s best skating talents. Whether you were watching the tour to simply see skating legends like Luis Tolentino and others in action, the site from the river banks from numerous cities would not be one soon forgotten by the skating community. The entire tour, called the Mississippi Grind, was the brain child of a local New Orleans skating enthusiast and took the skating world by storm. The skateboard park barge was made from an old converted tanker and housed wells for skaters to use as a half pipe as well as sporting ample grinding room for those who were eager to showcase their talents along the lip of the barge. The tour went close to 200 miles down the river from Minneapolis all the way through to New Orleans with numerous stops and brought in yet another innovative method, brought skating under the eyes of the American public. Skating has often been associated with deviant behaviour, but recent studies have shown that the activity of skating in skateboard parks has reduced the element of criminal activity in youth members taking part. Completely put together in an undisclosed shipyard, all the parts for the barge skateboarding park were cast in South California by a professional skate park creation company. Once shipped up to Minneapolis they were assembled and tested by a team of skating professionals, all while keeping the basics of flotation and physics in mind. After three solid years of planning, the barge was ready to go and put on an amazing tour that went without hitch and was highlighted in magazines and newspapers. The tour is over and the skateboarding park is currently sitting in New Orleans and awaiting a new home for a skate park for locals to enjoy. The big easy currently is without a skate park and the facilities will be welcome by all once offloaded off the barge. Dave Peterson is a freelance writer with an interest in shipping and sports. For this article, Dave conducted research at chatham dry dock and discussed the build with steel boat builders to discuss the skateboarding barge. This entry was posted in Land Sports, Skateboarding and tagged Red Bull Barge, Skateboard Park. Bookmark the permalink.